Pam Iorio is the former two-term Mayor of Tampa, Florida who is now a leadership speaker, advisor and author. Successfully leading the vibrant and growing city of Tampa for two terms, Iorio grappled with change, goal-setting, compromise and adversity. Now as a leadership speaker for corporations and trade associations, she delivers an inspiring and empowering message about straightforward leadership – the importance of leading yourself successfully so that you can effectively lead others. Her leadership book Straightforward:Ways to Live and Lead (2011) was called “the best business book of 2011” by Florida Trend Magazine. As mayor of the nation’s 54th largest city, Iorio’s tenure was marked by a revitalized downtown, massive investment in infrastructure, economic redevelopment through Community Redevelopment Areas, commitment to the arts, emphasis on neighborhood improvements, unprecedented reduction in crime, and fiscal soundness, with financial reserves tripling even during a recession. She left office in 2011 with an 87% approval rating. First elected to public office at age 26, Iorio was the youngest person ever to win a seat on the Board of County Commissioners for Hillsborough County, Florida.At age 27, she was selected as chairman of the board. In 1992, Iorio was elected for the first of three terms as the county’s supervisor of elections. In 1999, she served as the president of the State Association of Supervisors of Elections, where she performed as spokesperson for the organization during the highly publicized 2000 presidential election in Florida.Afterwards she helped lead efforts to reform Florida’s elections. In addition to her leadership speaking, Iorio is the Leader-in-Residence at the John H. Sykes College of Business at the University of Tampa. She serves on the advisory board for Celestar Corporation, a fast-growing knowledge and technology consulting company. She also serves on the board of the USF Foundation. In August of 2012, community leaders asked Iorio to become the interim CEO of the Children’s Board of Hillsborough County after the agency went through significant leadership challenges.Today, the agency is on a positive course after the implementation of organizational and fiscal improvements and she will be leaving this interim position in May 2013 upon the selection of a new leader. Iorio holds a BA degree in Political Science from The American University and a MA degree in History from the University of South Florida. Think Big! – Achieve Big! Working as a Wall Street financial analyst, being President of a $20 million sports nutrition company and serving as Chief Marketing Officer for a $700 million publicly traded company taught Dawna a great deal about success. But nothing taught her more than launching and recently selling her own two companies, allowing her to retire at age 43 (although she’s already planning the launch of her next company). Dawna credits several key factors for her corporate and entrepreneurial success. She’ll show you how believing in yourself, setting big goals and asking for what you want can catapult you to incredible new heights. She’ll share these secrets as well as offer tips on how to break free from your fears, so you can Think Big! and Achieve Big! Dawna Stone is a health, fitness and wellness expert appearing on The Today Show, MARTHA and morning news programs on NBC, CBS, ABC and FOX. She founded Women’s Running magazine and the Women’s Half Marathon series, helping thousands lead healthier lives. Dawna won NBC’s “The Apprentice: Martha Stewart” show, hosted “Health and Fitness Talk with Dawna Stone” on Sirius Satellite Radio and “Healthy Living with Dawna Stone” on FOX. Her first book, “Winning Nice” made Amazon’s list of top 100 business books. 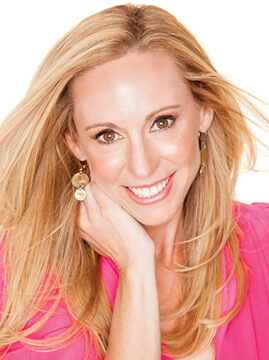 Her latest book, Healthy You!, was just released to rave reviews and she is launching a new company. Dawna was a Financial Analyst for Wall Street investment bank Morgan Stanley, a consultant for Deloitte Consulting, President of PR*Nutrition, Senior VP of Operations at Active.com and Chief Marketing Officer for a $700 million dollar publicly traded company. Dawna launched Women’s Running magazine in 2004 and the Women’s Half Marathon in 2009 and sold both companies in 2012. Dawna graduated from UC Berkeley and the Anderson School of Business at UCLA (MBA). She is an avid runner and Ironman triathlete. She lives in St. Petersburg, FL with her husband, five-year-old daughter, four-year-old son and 13-year-old puppy.